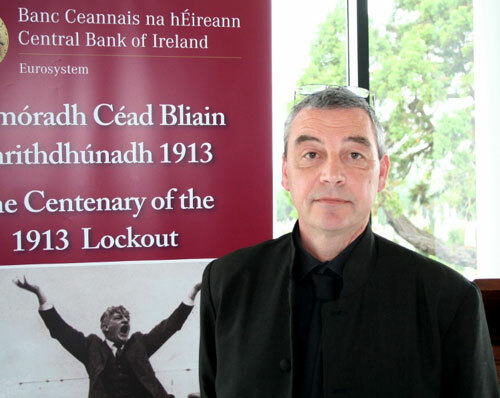 One of Ireland’s most important pre-independence anniversaries was commemorated this week on a new silver coin, the Great “Lock-out of 1913” is the subject for the Central Bank of Ireland’s latest collector coin. Michael Alexander of the London Banknote and Monetary Research Centre attended the launch ceremony and spoke to the designer of this new coin which goes on sale today. Rory Breslin, studied art at the National College of Art and Design as well as in England, France, the Czech Republic and Slovakia. He co-founded the Head Sculpture gallery in Dublin, and has lectured part-time in the National College of Art and Design. He has had numerous solo drawing and sculpture exhibitions in Ireland and abroad and currently lives in the West of Ireland. 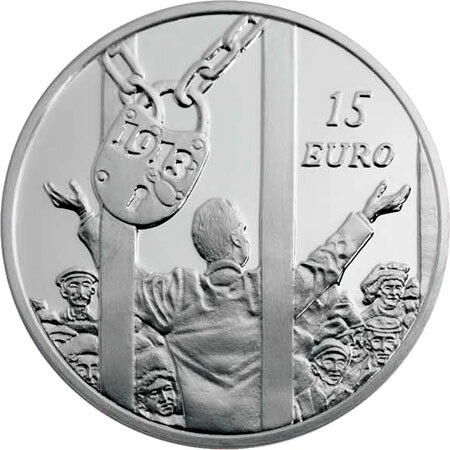 MA: The design for the Lock-out anniversary coin includes an image of Jim Larkin who was so instrumental in the event itself, so much so that a very well-known statue of Larkin located on O’Connell Street in that memorable pose – did it influence you in this coin’s design and how did you come to depict him from the back? MA: Is your depiction intentionally meant to look at the events before he became such a well-known figure? RB: No, not necessarily, it’s just a difference of emphasis – it’s about the conditions at the time, the people, the terrible conditions they lived in and the addition of women in the design, you don’t normally see women in the old photographs during the time, it’s mostly depictions of men – the women were normally minding the homes and children. 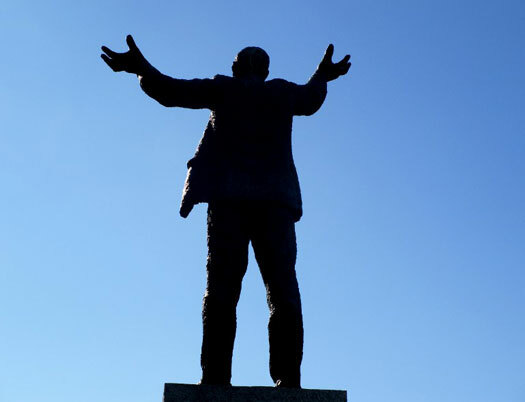 The coin’s design is meant to place more importance on the impoverished community as a whole so here you really just see the addition of Jim Larkin. MA: Now, as a sculptor who usually works with bronze – have you ever designed a coin before and how did you approach this task of designing something with such detail and realizing that it’s going to have to fit onto a 38 mm surface? RB: I do work with Bronze – by the ton! And no, I’ve never designed a coin before this commission. In terms of technique, as opposed to making the design for a coin rather than a sculpture, you have to work backwards, you see the piece in your head, you work out all the technical parts out and then, you brush away all of that aside – and then go back and just finish the piece. In some ways, it’s not very different from how I would approach any other commission. MA: Is this something you’d like to do again? RB: Yes… it’s certainly cleaner than making a sculpture (laughs) and a lot lighter! MA: As the designer, what would you like those who see the coin for the first time to take away with them as far as the design is concerned and possibly the message? RB: Well, if anything, perhaps a bit of human solidarity. We live in a world where we basically pay to live – and it may be a bit presumptuous of me to say that it may have any significant bearing – but it would to someone who read history and knew where they stand in relation to the event commemorated, that’s about it really. MA: Rory Breslin, thank you very much for your time today!